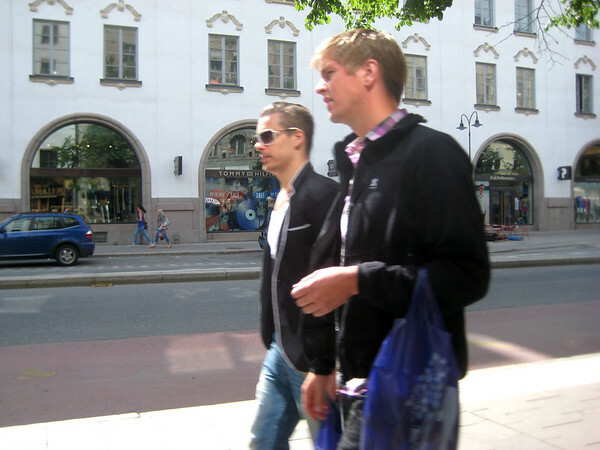 JenniferBack in spring of 2008, a fika conversation at work had turned to Sweden's princess Viktoria and her betrothal to a fellow named Daniel Westling, who had been her personal trainer at the gym. The Swedes didn't seem to like him too much, and I remembered that they said he "looks like a brat" (brat, with a short 'a', as in spoiled child, not brat with a longer 'a' as in bratwurst). "What's a 'brat', and how can you tell"? I asked, which led to a long discussion of it. Here's a pretty good description (in English) of what a Stockholm brat is. The short version is that a brat is a sub-class of the young and rich and idle, and even though that article is four years old now, the 'look' of a brat is still valid. But of course I wanted to see them for myself. 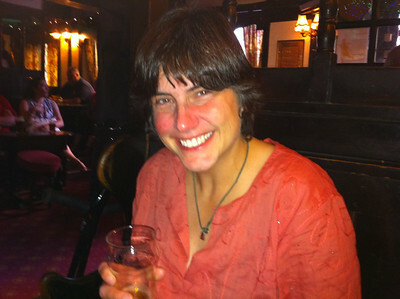 "Well, they hang out in Stureplan, and I often saw them walking past an English-style pub there that I liked to go to sometimes," said fellow post-doc K., who is partial to things British after spending some time at Oxford. So a plan was hatched, to go and sit ourselves comfortably with a beer (which real brats wouldn't touch, as being too prole), and observe these creatures in their native habitat. An odd thing that happened on the way in was that, somewhere between Märsta and Stockholm, our train was delayed because, as the announcer said, "there is an un-sober person on the tracks ahead of us." But we were routed around the person, and managed to get to her pub, The Bull and Bear, just after it opened. We therefore got great seats outside, facing the street, and commenced people watching. But it was a little too exposed, perhaps; as K. said, "It's hard to just look at people when they can look back." 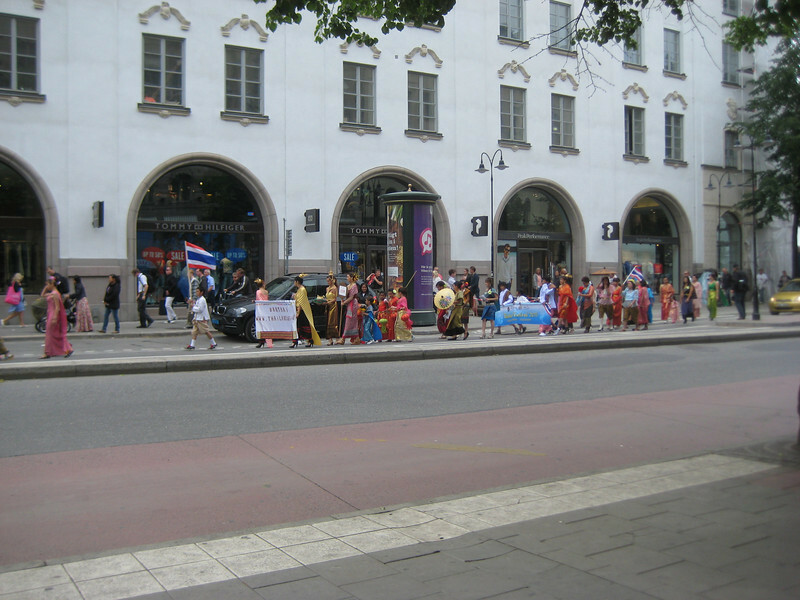 (Yes, I thought, that's a basic problem in behavioral research, for both the observer and the observed...) We were treated to a Thai parade, and a few brats (see picture above), but there were more tourists than brats. "Perhaps many of them have already gone away to their summer homes," said K.
We then took a bus to an even more British pub that K. likes, The Tudor Arms, which is small and cramped and cozy, has sports going on several TVs, and is more of a neighborhood hangout than a place to people-watch. 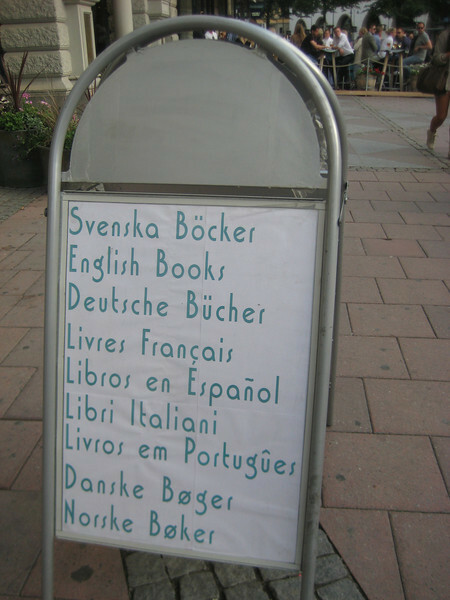 And here, also, there were more people speaking English than Swedish. 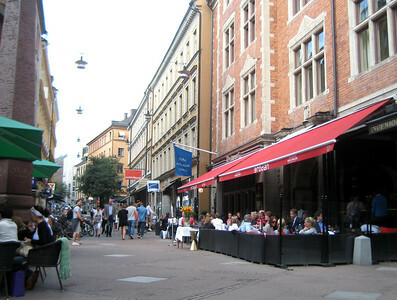 But eventually we'd had enough of beer and brats and Brits, and we made our way in the beautiful summer evening weather to Östermalmstorg, less fancy than Stureplan but still well within the borders of the well-to-do part of town. We took a rather frightening elevator down to the subway (it was shaking a lot) in order to get on the subway back to central station, and then a train home. And on the way back, our train was stopped again because of a person on the tracks, although this time, the conductor apparently didn't feel like giving us an assessment of their sobriety. "This is very weird," said K., "I commuted between Stockholm and Uppsala every day for a long time, and I never had a train delayed because of people on the tracks, and now we have had two in one day."